Yes, know your net worth! Here's a fun thing I tried and will encourage you to try. 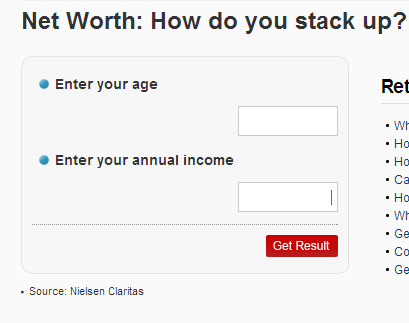 CNN has a tool for estimating what your net worth should be; by comparing your age to that of those in America and taking a weighted average of their income. It's very enlightening and can be saddening if your results were like mine. I can't even share the result with you. In the actual income, make sure you enter your salary/income for a year divided by 165 ($1 is now 165 naira). And please be kind enough to share your results. Here's another fun task I undertook. The minimum wage in US is $7.25/hour but can be taken as an average of $8/hour as some states have more than that federal baseline. And in the UK the minimum wage is £6.31/hour. And that's the least you can earn, and sometimes even if you are not working (social security). Here is the fun part. A regular job is 9 hours a day and 5 days a week. The average working days in a month is 22. So it comes to 9 x 22 = 198 hours a month. Now you see why good friends and families in the UK and US want you to come to there too. There's also the murderous tax. But for someone like you and me, with a college degree, our rates start from around $25/hour. Well so much for the preliminary, now to the crux. I have customized another Excel application, it will help you calculate your real net worth (not your expected net worth like the CNN tool I mentioned above). It's very easy to use and almost accurate. The calculation which is based on age is backed by a popular weak theory, and is the best I could find. Here is the Know Your Net Worth Excel application link.